Spring Chinook Salmon fishing season is in full swing on the Columbia and the Willamette river. 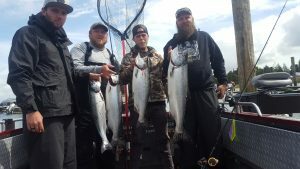 Salmon fishing has been decent, and with the warmer weather that will make the water warmer and the fishing will even get better. I have been concentrating my salmon fishing efforts on the Columbia river from your I 5 bridge down river. I also spend a lot of time on the Willamette river from Saint Johns bridge to the mouth of the Willamette river. Spring chinook salmon is probly if not the best eating fish in the Northwest. I will continue fishing for these tasty Spring salmon Intel late June. If salmon fishing is not your thing, maybe you’re thinking walleye. I can hook you up with some great Columbia river walleye fishing. I start walleye fishing on the Columbia river in May. Walleye in my opinion make some of the best fish tacos around. Of course we always have Columbia river monster sturgeon. 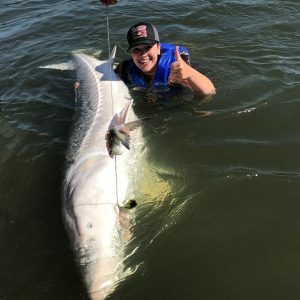 COLUMBIA river monster sturgeon will range between 7 and 10′ long of course this is a catch and release fishery only. Call me today for Salmon, sturgeon, walleye fishing I’ll hook you up.